Have a question about Tom Ford The Eye Defining Pen? Okay, so I think we can all agree that $50 for an eyeliner is ridiculous. I must say that I read a bunch of reviews on a couple of different beauty sites and everyone was saying that this is a holy grail item, so of course I was curious. I decided to shell-out the money just to see what all of the hype was about, and I must say, I was shocked. Both ends of this eyeliner are stunning! I even put the liner in my water line and didn't shed a single tear or get that burning sensation that you get with so many other liquid eyeliner pens. The formula is flawless and it is BLACK BLACK BLACK which is my personal favorite. It's honestly worth a try! Love it but Don't travel internationally with this. Everyone needs this in their life. I feel best eyeliner ever. Great for the beginner and expierenced alike. I know it's a splurge, but so very worth it. Lasted me nearly a year with putting it on almost every day, and it hadnt even begun to dry out which was unbelievable to me. 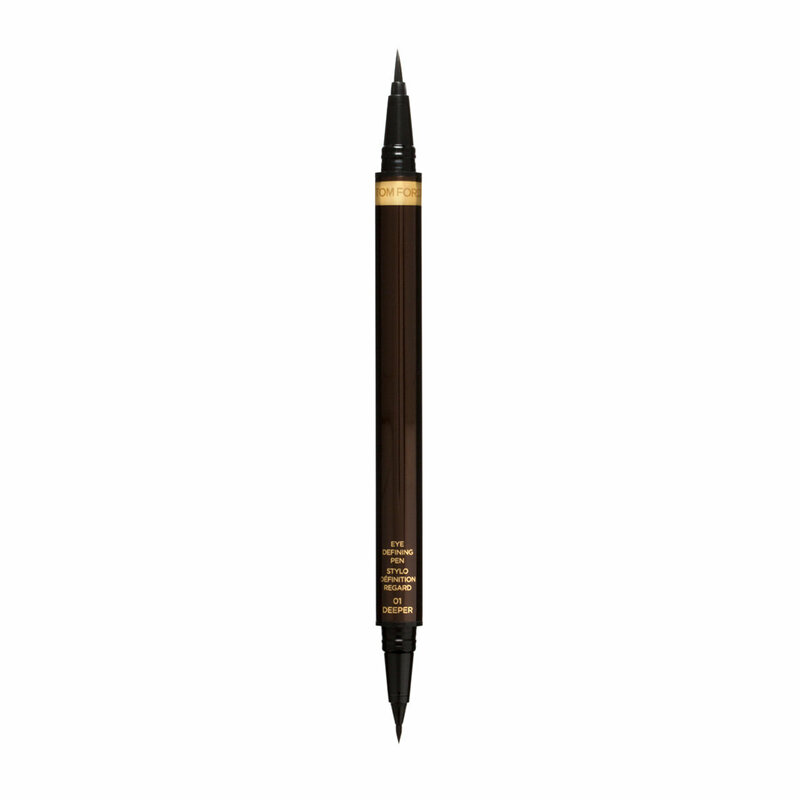 It's a great eyeliner, the blackest ink and glides on so easily. However, there are some qualms I have with it. It will bleed throughout the day nearest my inner corner/tear duct, which is frustrating. Also, the length of the pen is super annoying - I can't get close to my mirror without it banging and getting in the way. I do wish it was a bit shorter because of this. I also find the smaller tipped side to be a bit drier in formula than the long tipped side. Not sure why that is. Given the price, I do hope it last a long time, as other reviews have mentioned. Ugh, I wanted to love this SO BADLY. I used to be the queen of the winged liner, then I gave it up for a more natural look, and then when I saw this product on the market I thought it might be time to return to my winged glory. I was a long-time devotee to the Chanel Automatic Liquid Eyeliner (ÉCRITURE DE CHANEL), which in theory is very similar to this, minus the part where you have to click-up the "ink." That had been my holy grail for years, easily beating out any drugstore option, Charlotte Tilbury's Feline Flick (a bit too dry), and some of the popular South Korean/Japanese options on the market (they explode too easily on airplanes, even in the main cabin, rendering them useless). This product was primed to upset my HG Chanel liner.....except for the dual ends. That's right, the dual ends actually ruin it for me. The short end is just too short and inflexible for the way that I personally draw on a winged line, so I find myself ONLY using the longer, more flexible end. Sadly, the pen separates the ink flow to the two ends, so once I use up all the ink in the end I DO like, the pen will become useless to me. And, for this price, that's just absurd. So, I think I'll use this one up and return to the Chanel option, which is just as dark and long-lasting on the eyes....but is a longer-lasting and somewhat less expensive product. Ok, so I got this as a treat myself gift for a really big accomplishment for school. I thought "oh well I'll try it and keep it in my vanity." IT IS LIFE CHANGING!!! I lost it and then had to repurchase it because it is so magnificent that I needed it again. I wish I did not like it because of how expensive it is but I love it!! It lasts all day and is easy to handle. I had it for 5 months and worked everyday like it was new. Now I lost it but I am using this one and it is amazing. I have never encountered an eyeliner that is so easy to control, I use only the longer tip though but I have bought this pen over and over and over again. Lasts all day, when all the other make-up has faded after a very long day this is still there going great, it starts black and stays black! I have emailed Tom Ford and asked them to please please please release all the colors under the rainbow because I am actually stuck with that one color they have... and this is my only regret! Thanks Tom Ford! You've officially ruined me for all other eyeliners. The price tag is steep but this really is the best eyeliner I have ever used. 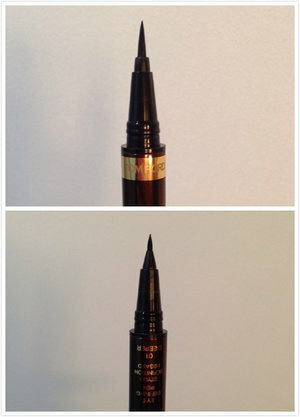 Super black, applies so easily, makes winged eyeliner effortless, and it doesn't run/fade. It lasts a long time (I've been using this one for 4 months at least, I believe) and I will definitely repurchase whenever it runs out. Decided to treat myself to this eyeliner and my first impression was that it was lovely. Tom Ford packaging is always gorgeous but most impressing was the eyeliner itself. It lasted all day and was easy to use to get a sharp clean line. I usually don't go for eyeliners that aren't matte but this one doesn't have too much shine to it which I like. Now on to the disappointing part, because of the expensive tag on this item I made sure after ever use to make sure the caps were on properly but somehow (in two months) the brush tip seemed to be clogging up and seemed to be getting dry. Because the brush had little liquid on it it would end up taking off some of the eyeliner I had put on and also caused the tip to fray when putting the cap on. I don't know if I got a defective product or if the brush tip just does that over time (even though I've read multiple reviews of people saying it lasts so long). For nearly $60 I need something to last longer than two months.